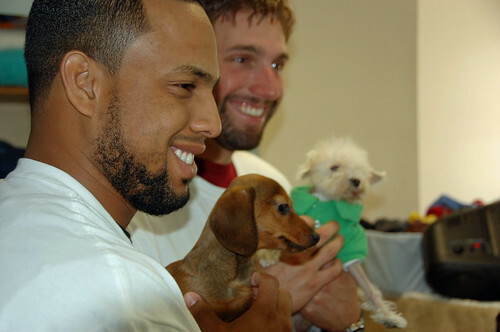 TEAMMATES IN THE COMMUNITY AT THE HUMANE SOCIETY. 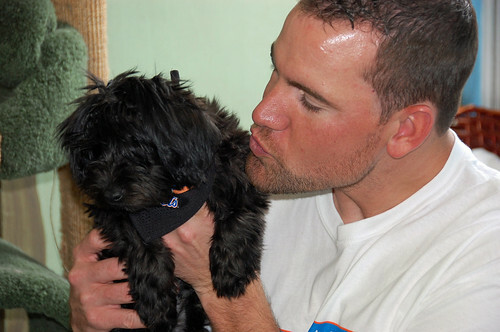 The Mets will help take care of cats and dogs up for adoption at a midtown Manhattan animal shelter in support of the Mayor’s Alliance for NYC’s Animals, a coalition of more than 160 animal rescue groups and shelters to end the killing of healthy and treatable cats and dogs. The players volunteering at today’s event were Jeff Francoeur (who arrived on foot, happily explaining that he didn’t live far away), Mike Pelfrey and Francisco Rodriguez. 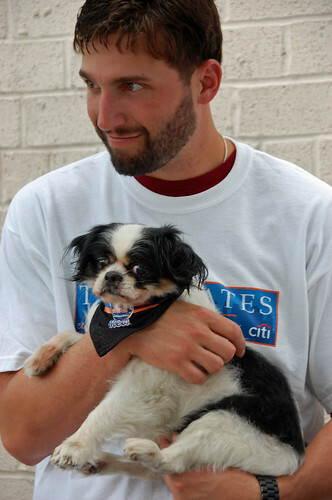 The destination was the Humane Society of New York, where a gaggle of volunteers, convincingly dressed in blue and orange, introduced the players to a selection of dogs and cats being cared for by the shelter. Mike said hello to some very affectionate kittens, while Jeff and Frankie went to give some much-needed love to two dogs with special needs. The star of the day was Willis, who has his own blog called The Willis Post. Here he is with a few friends. Next, up to the roof to play catch with a couple of lucky (and larger) dogs. The roof is fenced off for dogs, full of toys and tubs of water, lots of shade. The two dogs were perfectly happy to chase each other around the roof, catch a couple of tennis balls, and get water all over Jeff’s legs. “I’ll take you all to Georgia and show you grass like you’ve never seen,” Jeff remarked. The final event was canine ambulation. A quick trip down 59th Street took us to a pocket park that the volunteers use for giving the dogs a little exercise. Some photo ops in the park, letting the volunteers who are there every day get a little bit of the spotlight. The Mets also invited a season ticket holder to attend the event. This year, they have been extending these types of opportunities to select season ticket holders. I think it is a nice gesture, but as a potential season ticket holder, no perk is going to make me happy as the one that gives me a discount on my tickets (like every other team in MLB). But given the very thin list of privileges season ticket holders have, I am always happy to see another one added to it. This might have been a press event and a photo op, but I will tell you that the guys spent a lot of hands on time with the animals, and were completely genuine in their affection and their interest. 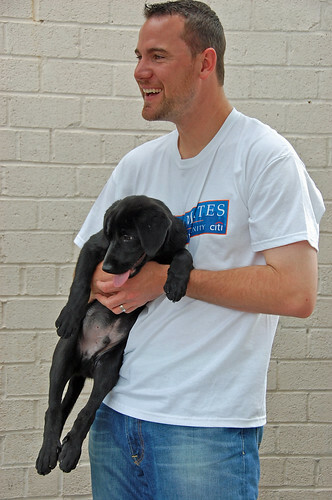 This wasn’t a “walk by the cages and pose with the volunteers” event, and it certainly could have been. To be fair, I imagine this was a more fun event than the one the day before where the project was painting a roof, but even viewing the event through my cynical New Yorker eye, the animals got love and attention and the volunteers were thrilled to have them around. 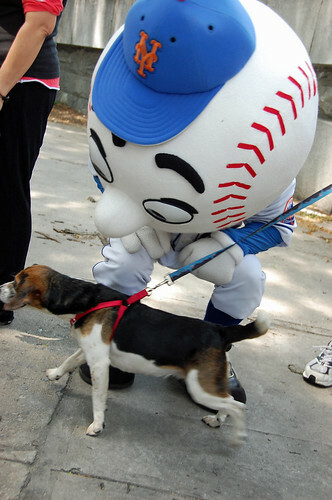 Mr. Met cracked me up. I never see the guy outside of Citi Field so it was a source of great amusement to me to see him standing on the sidewalk and waving at the cars heading for the 59th St. Bridge approach. The dude is always on, I will tell you that. I am currently the caretaker of a shelter cat, and his predecessor also came from a shelter. This is a subject near and dear to my heart. There are so many animals in the shelters right now, and they can use your dollars and your hours. 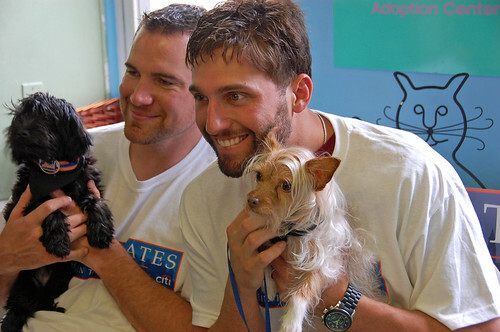 The Humane Society is hoping they are now inundated with phone calls of people who want to adopt, donate and volunteer as the result of the Mets’ visit. It doesn’t have to be the Humane Society of New York, I am sure your local neighborhood shelter would be happy to have you. A lovely slideshow of the event follows. Please do not use these photos, even with credit, without asking first. Thanks.